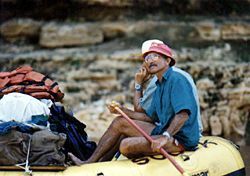 It is with great sadness that I announce the passing of my close friend and fellow river guide, Conrad Hirsh, founder of RemoteRiver Expeditions, who died on October 7th 1999, in Nairobi, Kenya, after battling brain cancer for which he had received treatment during the summer in London. A memorial service was held in Langata on December 5th, 1999. It was attended by over one hundred friends and relatives from around the world, including his brother Oliver, a musician from Denmark, and his son, Yohannes Conrad Hirsh, of Addis Ababa, Ethiopia. 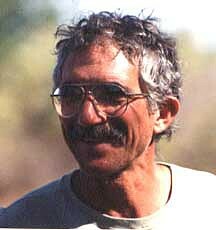 Born in New York City, educated at Reed College and Stanford, Conrad Hirsh went to Ethiopia as a Peace Corps Volunteer in 1964. 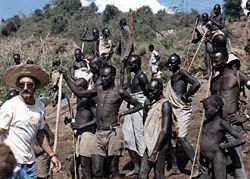 He got involved with river-running through friendship with the founders of Sobek Expeditions who pioneered the Omo River in 1973. Conrad guided Omo River, Mt. 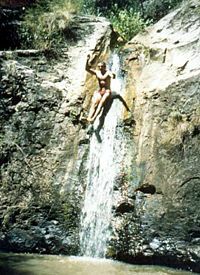 Kilimanjaro climbs, and Rwanda gorilla trips for Sobek from 1979-1990, and first explored the Rufiji River in Tanzania in 1979. Other exploratory river trips that Conrad has led or participated in include: Blue Nile 1975, Betsiboka, Mahajilo, and Mahajamba 1985, lower Mahajamba 1987, Manambolo 1991, Mangoky 1992, Great Ruaha 1990, Tekeze 1996, Mahavavy 1998. 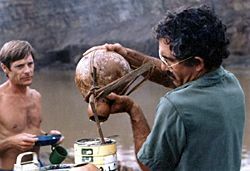 Conrad founded Remote River Expeditions in 1991 continuing to maintain a close connection with Mountain Travel/Sobek. 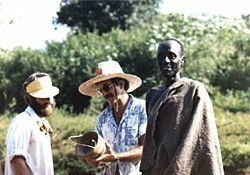 Based in Nairobi beginning in 1978, Conrad spent much of the year in Madagascar (as much as possible) and time in Kenya and Ethiopia. He was fluent in Amharic, Kiswahili and French making him feel at home throughout East Africa. His special interests included birds and wildlife, cooking, tennis, live music, and of course, river exploration. 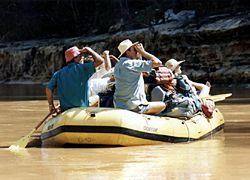 The June 2000 Memorial Trip on Madagascar's Tsiribihina River saw a wonderful gathering of people from around the world. Members of the group were Mary Kettman, Sarah Fields, Gerard Ravoajanahary, Brian Gallagher, Rob Fallon, Charlotte Bildstedfelt, Joe Stoner, David K. Brooks, Poun, Maurizio Melloni, Erika Jenszen and Gary Lemmer. We were blessed with beautiful weather, few insects, many lemurs, excellent birds, nightly music, superb food, and a feature that would have made Conrad especially proud - a bit of romance. On our memorable journey we shared the nightly cooking duties and the undeclared "contest in the kitchen" provided wonderful evening entertainment. A nightly feature was "Poun's Perfect Rice", and highlighted dishes included Erika's "Spicy Indian Eggs"; Joey's "Saut' du Artichoke Hearts" and Maurizio's "Pasta With Sand" not to mention frequent Malagasy delights by Chief Chef Gerard. As with Conrad, Gerard's love of the wilderness was infectious. His expertise, and uncanny ability to "call in" birds and lemurs (and Pouns sharp eyes) assured that we didn't miss a thing. At night Gerard delighted us with his gifted guitar playing and songs in French, Malagasy and English. "the best trip I've ever done, no other people for a week...no engines...what peace!" Thanks to Conrad Remote River Expeditions exists today. Although he is no longer with us his legacy lives on. It's alive in the memories of those he shared time with and in the promise of the adventures to come. During our float, at his request, we left some of ashes and at the same time a part of ourselves. We invite you to share the magic first hand and experience the romance of East Africa in a most personal and rewarding way. We hope you've enjoyed these words and images. We're continuing to compile stories, images, and remembrances of Conrad and invite you share yours with us. In turn, we'll be happy to share them with others through the website and (at a later date) for possible book publication. Also, if you've has lost contact with someone that you met through your association with Conrad, we'd be happy to try and put you all back in touch with each other. Let us know if we can help. Again, many thanks to Madagascar Air Tours, Air Madagascar, Mary, Gerard, Brain, Poun, and everyone who participated in and worked so hard to make the Memorial Trip a success. See you on the water.